It is extremely rare to find fully-finished pastels by Camille Pissarro from the 1870s, and so we were very excited when we received two such pastels on consignment from a private American collector, who bought them from us around twenty years ago, and now wishes to sell them. Paysage à Pontoise above and Une rue à l’Hermitage, Pontoise below both show a dusty country path leading into the distance towards the foot of the Hermitage hills. Listed one after the other in Pissarro and Venturi’s 1939 catalogue raisonné, it is likely that the two pastels were executed in close succession. After being separated for a long time, these two pastels are finally back together for the first time in the Stern Pissarro Gallery. Both works relate closely to the period in which Pissarro worked with Cézanne in Pontoise in the mid-1870s. Following Camille’s move to Pontoise, Cézanne frequently visited Pissarro and together they would draw and paint the local landscape. They often depicted the same motifs: country paths, houses and the Hermitage hills. As they worked together, both artists adapted their styles in different ways, adopting elements of the other’s work. 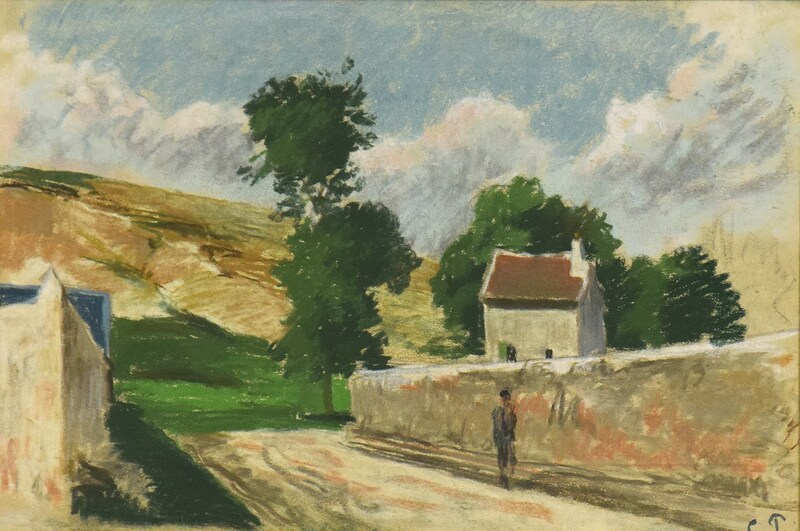 Cézanne began studying Pissarro’s techniques by copying his landscapes, notably Pissarro’s Louveciennes (1871). Under Pissarro’s influence, Cézanne palette became gradually lighter. Although Cézanne was nine years Pissarro’s junior, Pissarro was equally receptive to the stylistic choices of his protégé, and after working alongside Cézanne, he started to pay closer attention to geometric forms and increasingly used a palette knife to apply paint to his canvases. In 2005, Joachim Pissarro curated an extraordinary exhibition at the Musée d’Orsay in Paris and the MoMA in New York, which focused on Camille Pissarro and Paul Cézanne’s artistic relationship. “Pioneering Modern Painting: Cézanne and Pissarro,” showed eighty paintings and several drawings, which highlighted how the two artists worked side by side and learned from one another over a period of about ten years. The reciprocal impact of the two artists on each other’s work is undeniable. As Cézanne would later recall, “we learned everything we do from Pissarro…it’s he who was really the first Impressionist.” Indeed, if Cézanne is considered the father of modern art because of his influence on the development of Cubism, then Pissarro is certainly its grandfather. For more information on these works, please contact stern@pissarro.com or call the gallery on +44 (0)20 7409 0077.